Because I want to remember it all...: It concludes. The spooky season is over. 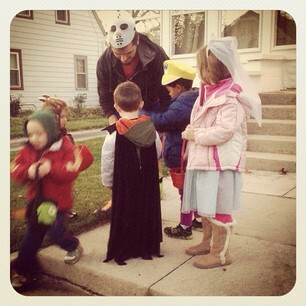 We went trick or treating in our neighborhood last night and unlike last week, the weather was pretty awesome. It was dry and relatively windless...not much more you can ask for in Wisconsin on October 31st. I pretty much let him eat what he wanted last night (not entirely, but close enough) and today I let him have a couple of pieces before telling him to pick out 4 more. I explained that the rest were headed to the troops and he could ration his final pieces out however he wanted. This brought on ZERO complaints. He accepted this without a second thought and even said he wanted to share one of his final four pieces with the neighbor. Everyone has their own ideas of how to deal with Halloween candy...I've heard of people not letting their kids have any, I've heard of no restrictions at all, I've heard of 10 pieces, I've heard of 1 a day for a few weeks and everything in between. I felt like 4 pieces was a little stingy actually, but since he didn't seem to care I didn't offer up any more and we're moving on. Wondering what some of you decided to do! Now to learn how to ration it to myself properly. the final picture of your two is a GREAT one! a definite framer!